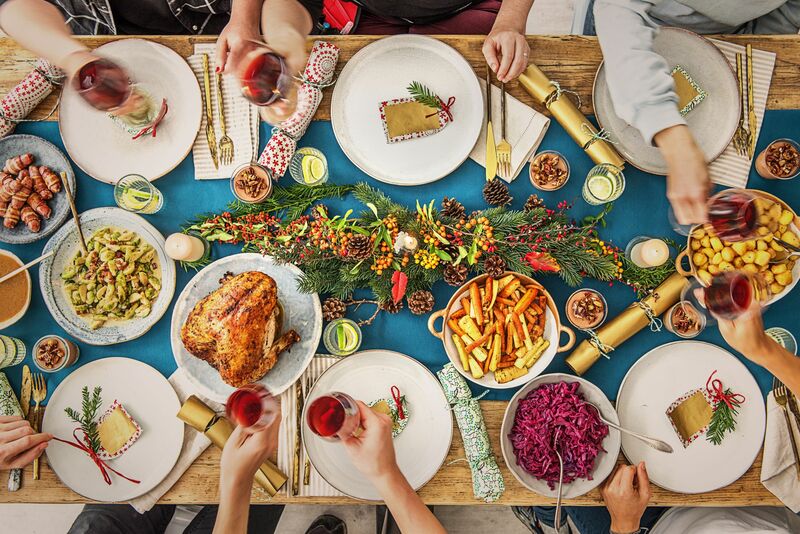 Christmas is now on the horizon and if, like me, Christmas dinner is the meal of the year, you might already be planning your menu. That’s the good bit. The not so good bit is the jostling for an online Christmas delivery slot with your favourite supermarket (Ocado released theirs a couple of weeks ago!) or jostling the crowds in the aisles wondering how early to buy your veg and whether your portion sizes are too meagre or too generous. I write endless lists but there’s always something I forget – usually something basic like plain flour or cinnamon. Unless you do a lot of cooking some things don’t get replaced often enough. Then there are the timings. What do you do when? How soon should you start preparing? I’ve written before about HelloFresh who offer a food box subscription service with fresh produce, all the stocks, sauces and spices you’ll need and recipe cards with instructions even the most hopeless cook can follow. HelloFresh also offers a box for vegetarians and a classic box with more adult and spicier meals. With the possible exception of a splash of olive oil, milk or water, there is nothing else you need to provide. And they have just released a new box just in time for Christmas. Yes, you can now have your Christmas lunch boxed up and sent to your door ready to cook, together with full instructions and all the spices and condiments you need. 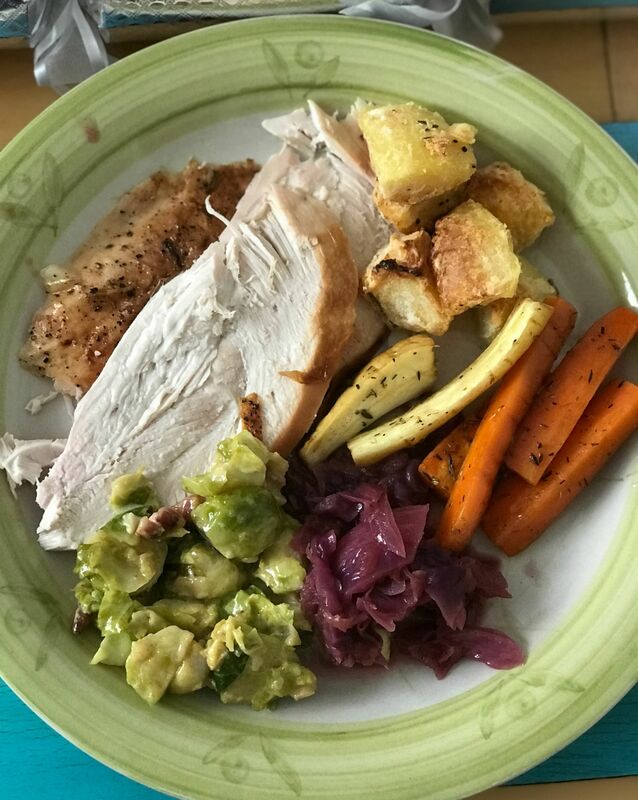 We were sent a box to try and, not daunted by my previous Hellofresh attempts which all worked extremely well (if I do say so myself), we sat down to an early Christmas dinner in October. One thing I particularly love about HelloFresh is that the quality of the produce is always top notch. The box arrives with frozen and chilled items carefully protected with ice blocks and recyclable wool. The fresh vegetables were in a separate section together with a brown paper bag containing items such as garlic cloves, thyme, cinnamon and a star anise. Tip: Check everything is in the box before you start to cook and that you know what goes with what. The produce came with a comprehensive leaflet which gave clear instructions with pictures and even had some cut-out DIY place cards for your table. Tip: Read through the menu cards carefully and make a note of timings. I made a separate list. This is the menu for 4 people. Don’t be fooled by the gravy. It’s proper gravy which you prepare the night before using root veg and chicken drumsticks to create a stock. (A really clever idea if you don’t have bones to hand!). Although the menu looks simple, I’d say this is a meal which needs to be prepared by quite an experienced cook. The menu cards are very helpful but there is an assumption of a basic level of cooking skills here. Tip: make sure you’ve got all the equipment you need – chopping board, fine grater, 2 roasting trays, foil, large spoon, large saucepan, colander, peeler, coarse grater, wide-bottomed saucepan with a lid, large baking tray and a large frying pan with a lid. For a start, you need to allocate 3 hours preparation time the night before. It’s very strange prepping Christmas veg without the sound of Carols at Kings and a glass of Sherry I can tell you. You need to make your gravy, prepare your Pigs in Blankets and prep the veg. You’ll also need to make sure that you’ve enough room in the fridge to pop in bowls containing your veg. The potatoes can sit in water in a saucepan overnight. Initially I thought taking up to 2 hours to make gravy was a bit of a faff, but actually, it did make a difference. That’s something else I love about HelloFresh, they teach you cooking skills and techniques in easy to understand ways. 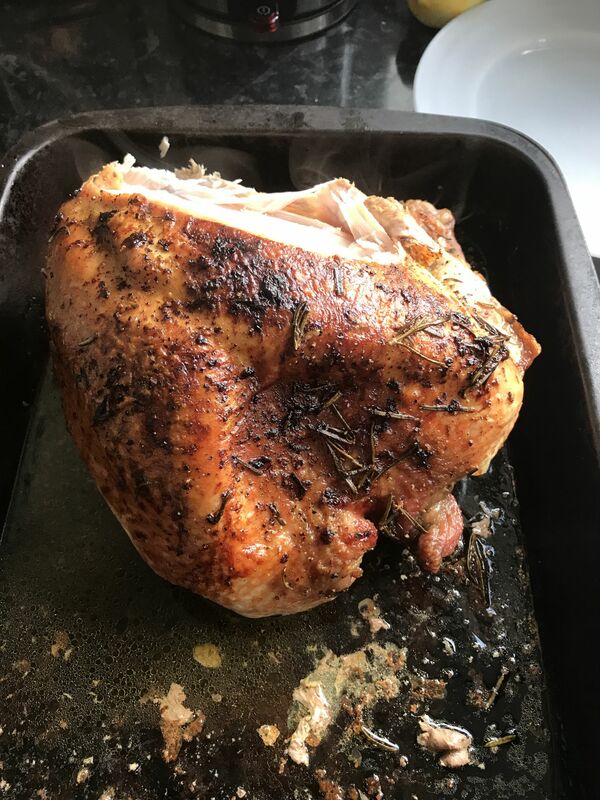 On the morning itself, you still need to be up and at it quite early (absolutely no problem if you have kids of course) as the turkey needs to go in for 2 hours and you’ll need space in your oven for baking trays with your potatoes and root veg. The red cabbage cooks in a saucepan on the hob and the Brussels are pan fried. I am campaigning for a new oven because ours, which must be 10 years old if it’s a day, is pretty small with two shelves so we are always risking burns by lugging the racks in and out to make space. Assembling the rest of the lunch is pretty labour intensive – not much chance to drift about with a bucks fizz in a sparkly frock. (I don’t think I have ever managed that). You need to parboil the potatoes, fluff them up and add some rosemary before they go into the oven. The carrots and parsnips are drizzled with honey and sprinkled with thyme. 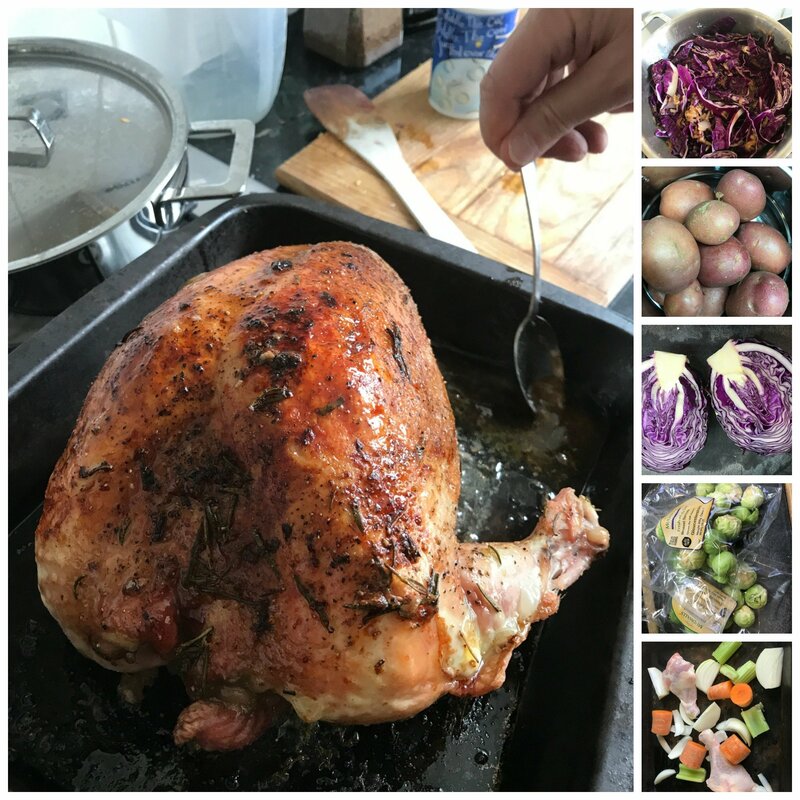 The red cabbage cooks with Bramley apple, red onion and cinnamon and the Brussels are done last with the garlic, cream and pancetta in the frying pan. If I had a little request it would be for the ingredients and recipe instructions to be in the same place. There’s a lot of flipping back and forth to find out what’s next. I would also have liked a structured time-table rather than timings for each accompaniment being separate and also a conversion from degrees C to gas mark for those of us who are dealing with antique ovens. 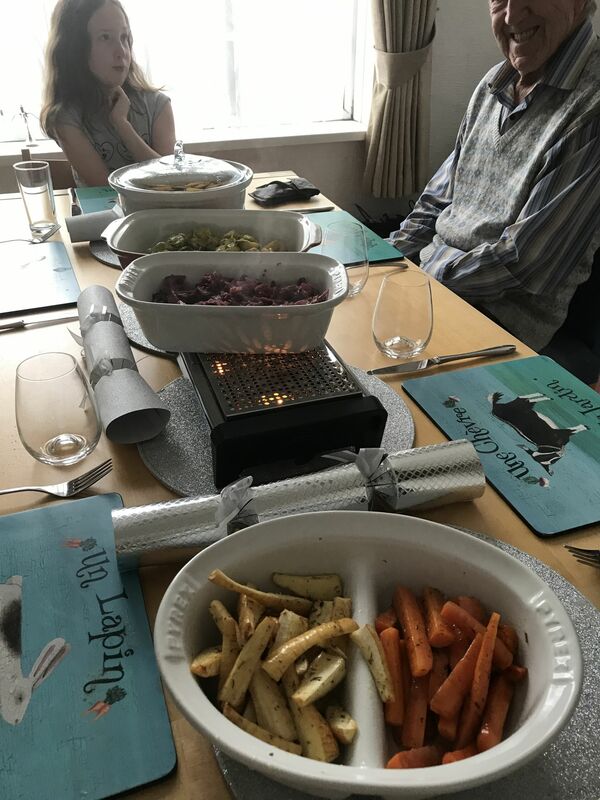 The food provided is designed to serve 4 but since Caitlin and Ieuan have smaller appetites, we managed to feed my mum and dad quite comfortably as well. Assembling the meal is all hands on deck and we used some Brabantia food warmers to keep the serving dishes hot. One of the biggest challenges is keeping everything piping hot, isn’t it? I have to say the meal was lovely – full compliments to the cook! The Husband has now delegated Christmas dinner back to me as he has been at the helm for the past few years. 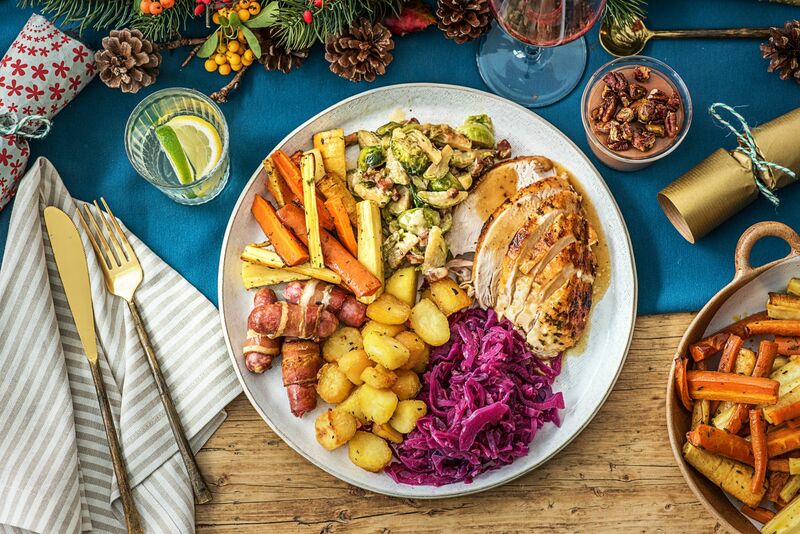 The HelloFresh Christmas Box can be ordered for 4, 6, 8 or 10 people. It contains premium, pre-portioned ingredients selected from top suppliers, the step by step recipe cards and there is also an option to add in a delicious dessert, Chocolate Orange Pots with a Biscuit Base and Caramelised Nuts. The box costs from £69.99 for 4 (without dessert) up to £149.99 for 10 with dessert. There does not currently seem to be a vegetarian Christmas box. At £17.50 per head, I think the box is very good value indeed. The dessert for 4 people costs an extra £10 but we prefer a Christmas pudding. There’s no stressful shopping – although you might want to stock up on extras such as Cranberry Sauce or Bread Sauce, depending on your preference. For more information about the Christmas box visit www.hellofresh.co.uk or you can contact them on Twitter or Facebook. *We were sent one Christmas box for four people for the purpose of this post. "Win A Magnetips Colour Edition Bundle worth £60"
"Should you buy your child a smartphone for Christmas?" I love this idea. Everything looks and sounds delicious, and I would much rather everything was delivered to me than having to find it all in Waitrose! This is a fabulous idea if you want to take the stress out of shopping for Christmas dinner. This is a really great idea, and definitely takes the stress out of shopping for it all! I am a fan of Hello Fresh, but I do agree..you kind of atleast…slightly need to know what you are doing. This all looks scrummy though! Well done! I’ve been thinking about signing up to Hello Fresh, as I want to start eating healthier. This looks likes a perfect way to get a good meal on the table for the holidays. I’ve always wondered if these boxes yeild enough food, but it certainly looked like it from the photos. 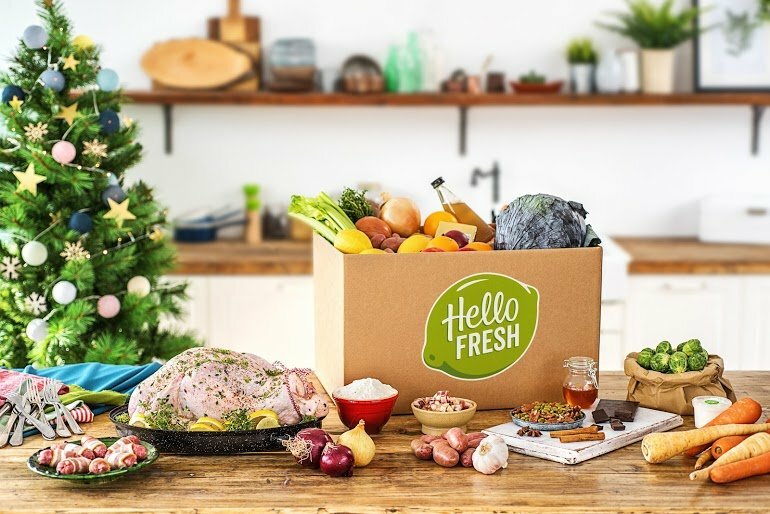 I tried Hello Fresh recently, but didn’t realise they did a Christmas version. What a great idea!